A team of researchers with Purdue University has demonstrated the highest reported conductivity for an organic radical polymer to date, moving another step closer to their use in electronics. In their paper published in the journal Science, the group describes the technique they used and offer an opinion on why it produced the results they found. Jodie Lutkenhaus, with Texas A&M University writes a Perspectives piece on the work done by the team in the same journal issue, and discusses further possible research in the area. As Lutkenhaus notes, organic radical polymers (ORPs), flexible plastics, have properties that could make them suitable for use in a wide variety of applications, such as battery storage, electronics and memory devices. But that requires a technique to make them run faster. ORPs are made up of a hydrocarbon backbone and radical function groups that hang off of them like bulbs on a string of Christmas lights. Currently, they are used mainly in batteries, and perform almost like capacitors. This is because they work as conjugated polymers—charges move along the backbone due to electronic delocalization. In this new effort, the researchers took a new approach that they believe allows the charge to move directly between the radical function groups, which produces much faster movement. The researchers started with traditional strands of PTEO ORPs, which they refer to as random coils. In such a configuration, they note, the radical groups were initially too far apart to carry a charge very far. To bring them closer together, the team applied thermal annealing (heating them and then allowing them to cool). Doing so, they report, caused a dramatic speed-up of the charge when it was applied. The team does not yet know for certain why, but they have a theory. They believe the annealing process caused different parts of the strand making up the coil to bend closer to one another, bringing them close enough together so that the radical groups from both parts of the strand could share electron transport. The work represents a step toward using ORPs in electronics, though there is one major obstacle yet to overcome—the technique only works for very short distances. To be used in applications other than batteries, ORPs will need to carry a charge much farther. Solid-state conducting polymers usually have highly conjugated macromolecular backbones and require intentional doping in order to achieve high electrical conductivities. Conversely, single-component, charge-neutral macromolecules could be synthetically simpler and have improved processibility and ambient stability. We show that poly(4-glycidyloxy-2,2,6,6-tetramethylpiperidine-1-oxyl), a nonconjugated radical polymer with a subambient glass transition temperature, underwent rapid solid-state charge transfer reactions and had an electrical conductivity of up to 28 siemens per meter over channel lengths up to 0.6 micrometers. 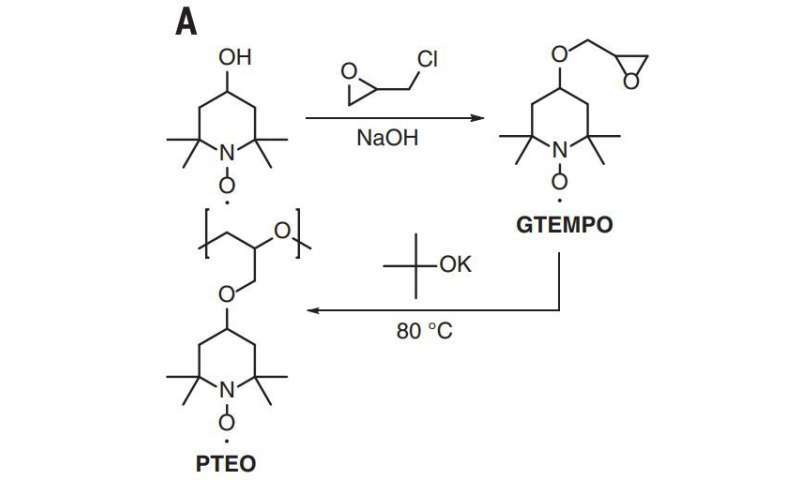 The charge transport through the radical polymer film was enabled with thermal annealing at 80°C, which allowed for the formation of a percolating network of open-shell sites in electronic communication with one another. The electrical conductivity was not enhanced by intentional doping, and thin films of this material showed high optical transparency.